Ezra Edgar Witter was a holder of many (at least 15) US and Canadian patents between 1888 and 1920 for various devices (mostly agricultural), like machines for making fences, marker for corn planters, corn harvesters, lubricator, match safe, hinge, etc. One of the patents of Ezra Witter was for adding machine (patent US423364 from 1890). 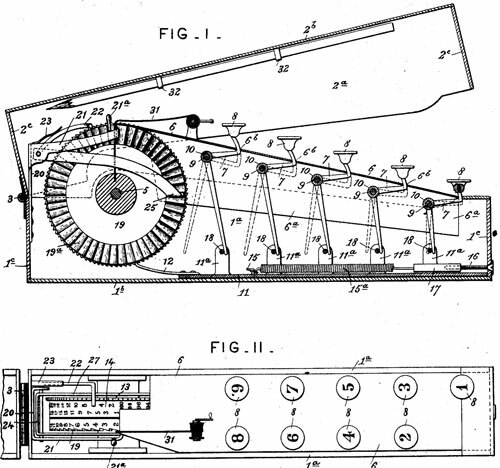 The adding machine of Ezra Edgar Witter is a simple one-column keyboard adder (see the patent drawing below). It was designed as a cheap and portable device, provided with a series of keys which operate through suitable mechanism upon counting-wheels which register the amount added up. Who was the inventor Ezra Edgar Witter? Ezra Edgar Witter was born on 18 Feb. 1855 in Union, Ohio. He was the baby of the family of Elijah Witter III (b. 27 Mar. 1807 in Geneva, Ontario, New York), a farmer and deacon of the local baptist church in Milford Center, OH, and Amy Ann Witter, nee Ballou (b. 1811 in Massachusetts–d. 27 Mar 1883 in Milford Center, OH). Elijah Witter III (see the lower portrait) was a descendant (6th generation) of the early settler William Witter, who came in America in 1640 with his family and settled at Lynn, Mass. In 1829 Elijah Witter moved with a rifle in his hand and a pack on his back from his home in Ontario, New York, to Union, Ohio, where in 1830 he married to Amy Ann Ballou, a daughter of Martin (1781-1869, a farmer) and Elizabeth (Betsey) Ballou, nee Lyon (1779-1851). Elijah was the owner of two farms in Ohio (500 acres in Union county and 600 acres in Madison county). Elijah and Amy Witter had ten children—seven boys: Elijah Martin (b. 1833), Henry Harrison (b. 1836), Albert (b. 1840), Alfred (1845-1906), William (1847-1850), Marvin (1849-1856), and Ezra (b. 1855), and three daughters: Lucy Ann (b. 1831), Eunice Betsey (b. 1835), and Maria Louisa (1851-1872). In the middle 1870s Ezra Witter studied classical studies at Denison University, Granville, Ohio (interestingly, at other times pupils of the same small college were some other calculating machines inventors, like Orlando Lane Castle and George Stibitz). 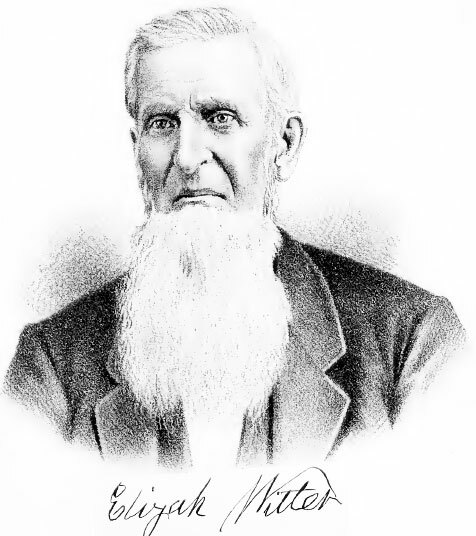 After graduating at Denison University, Ezra Edgar Witter returned to Milford Center and was engaged in his father's farms. On 10 May, 1880, Ezra Witter married to Sarah Elizabeth Wolfe (b. 1 April 1854 in Union, OH—died 1920). They had one daughter: Leona Pauline (1880-1921), and three sons: Alva (b. 1882), Chester Warren Edison (1884-1975), and Guy M. (b. 1886). Last decades of his life Ezra Witter spent in Lake County, Illinois, with the family of his daughter, Leona Dreyer (Witter). Ezra Edgar Witter died on 2 March, 1939, in Zion, Lake County, Illinois, and was buried in the Lake Mound Cemetery, Zion.